I wrote an exclusive article for Haute Living about my thoughts and experience on Israel. I wanted to share it on my blog as well if you haven’t checked it out! Click here if you want to view it on the Haute Living website. Israel is one of the most fascinating and beautiful destinations in the world. Despite it’s rich history, culture and rapid growth, Israel along with much of the Middle East remains an untouchable warzone in the minds and media of most western countries. Growing up immersed in Israeli culture and surrounded by my Israel family, I feel extremely connected to Israel. Looking back on the summers I spent exploring the country, I feel a sense of nostalgia and appreciation for my homeland. Through media and misconception, the beauty and magic of Israel is largely lost behind a constant portrayal of war and terrorism. I constantly get asked the same questions about safety and if I’m scared to go, beyond that point people seem to be unaware of what Israel has to offer. That is what made this trip so important for me. I want to show people Israel as I know it. I want people to see the country through my eyes, and through the eyes of people who call Israel home. Check out my guide to all things Israel and my highlights from my most recent trip, as well as a video of my recent trip in collaboration with Ciroc Vodka. Dan Hotels is the most prestigious hotel chain in Israel. When planning my trip there was no question in my mind that was where I was going to stay. It is the most recognized name in the Israeli hotel industry and very well respected. The Dan Hotel Collection includes 14 hotels within Israel, all offering a unique and special experience. I chose to stay at the famous King David Hotel in Jerusalem, as well as the Dan Tel Aviv. I highly recommend this exquisite hotel chain if you are planning to visit Israel. One of the world’s most legendary hotels which is known for accommodating some of the world’s most important people, The King David is a landmark in the unique and fascinating city of Jerusalem. With beautiful views of the Old City, the hotel is located just a short 15 minute walk away from the Old City walls where within lies the old marketplace, Western Wall, Dome of the Rock mosque, Via Dolorosa and the Church of the Holy Sepulcher, where Jesus was crucified. We also had the opportunity to meet Executive Chef David Bitton of one of Israel’s finest restaurants located inside the King David. He invited me into his kitchen and cooked some of his favorite dishes for me, and also treated my family and I to a special dinner at the restaurant. He presented us with his Olive Oil Tasting Menu which included creative dishes such as Golden Quail Egg-yolk Toffee, Tomato Leather filled with Sea Fish Salad, Eggplant Oil & Tomato Gelee, Olive Oil Candies and much more. It was an incredible and unique culinary experience. Located in the heart of the city and overlooking the Mediterranean Sea and Tel Aviv’s lively beaches, Dan Tel Aviv is in the perfect location. Steps from the beach and the city’s greatest shopping areas, we had the luxury of walking everywhere we wanted to go from the hotel. The spectacular sea view pool, luxurious rooms and close proximity to the beach are just a few of these hotel’s special features. The magical city of Jerusalem still fascinates me every time I go. There is just so much history and you feel like you are transported back in time thousands of years. Walking through the Old City and visiting the Western Wall is always one of my favorite things to do when I’m in Israel. Whether you are Jewish, Christian or Muslim, Jerusalem is the hub for all religions and I think everyone should visit at least once in their lifetime. Tel Aviv is like any metropolitan city. It’s almost it’s own “bubble” within Israel. It’s a lot like Los Angeles actually. It has great shopping, good-looking people, beautiful beaches and an exciting nightlife. I usually spend my days on the beach or do some shopping on Allenby & Dizengoff Street, and go out at night to a bar or club near the beach. The city has an amazing restaurants and a great dining scene. 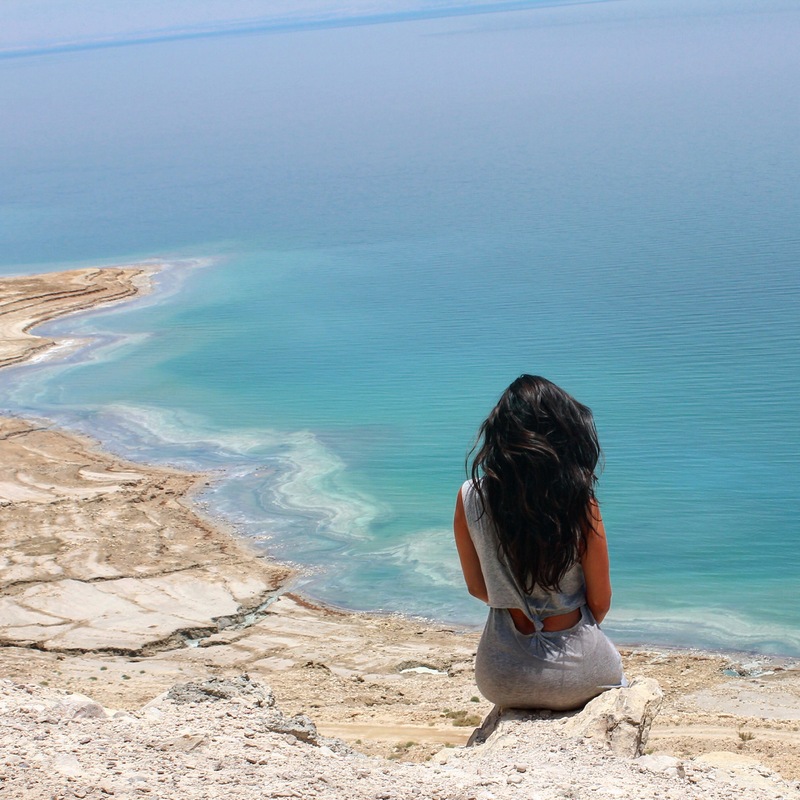 If you have never visited before, the Dead Sea is a must. It’s the lowest point on earth and extremely hot in the summer, which is when I usually go. During the summer months the water feels like hot bath water. The water is far from refreshing in 100 degree+ weather, but it’s still worth the experience. I always enjoy a nice cool beach shower after coming out of the water. The sea is made of 30% salt (regular oceans are around 3% salt), to give you a comparison. The salt makes the water feel oily and it’s a natural spa treatment for the skin. It cleanses, detoxifies and helps with symptoms from arthritis, psoriasis, allergies, wrinkling and aging. People come from all over the world to the Dead Sea for skin treatments. My skin feels like silk after a visit to the Dead Sea. Not only is the water good for the skin, but also it’s fun to float in the water! Eilat is a fun beach town, on the southern tip of Israel adjacent the Red Sea, lying on the Egypt and Jordanian border. I found it to be one of the best snorkeling destinations in the world; the water is clear and the underwater life is vibrant and colorful. Eilat nightlife is fun in as well– there are lots of parties and clubs around the beach. The resorts are beautiful, but can also be on the expensive side. I recommend staying at Dan Eilat, which was recently voted as one of the top 10 hotels in the Mediterranean and Africa by Conde Nast Traveler. Besides hitting up the beach, I recommend visiting the Dolphin Reef Eilat. It is a haven in the middle of paradise with it’s own private beach where you can dive with dolphins right off the shore. It didn’t feel like an establishment when the dolphins are being held captive. The dolphins are wild and come naturally to the shore of the Dolphin Reef to get fed every day. It was a special and unique experience and one of the highlights of my trip.